Employers offering high-deductible health plans grew almost 300% since 2009 when [PWC] began tracking employer health plan design. Although consumers now think more about what services to use, this trend can also inhibit early diagnosis and result in more costly chronic care management. 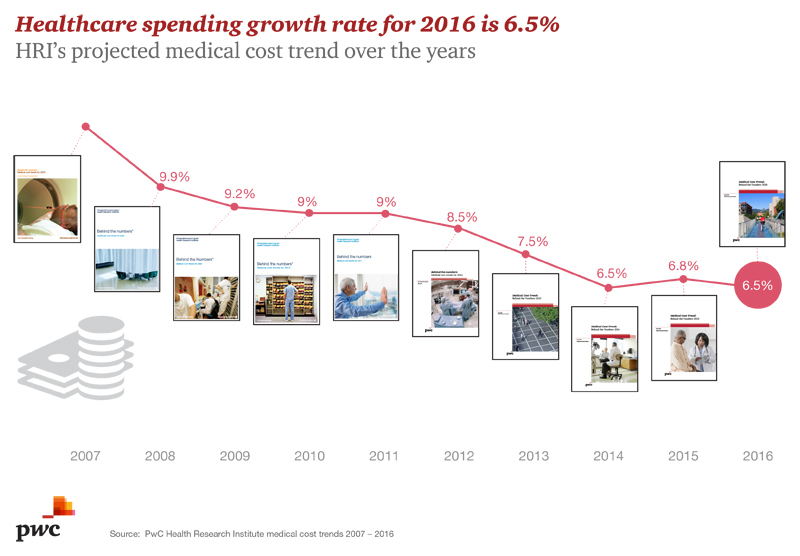 The healthcare-spending trajectory has leveled off but is not decreasing. Private healthcare spending continues to increase faster than the economy despite steps taken to bend the cost curve. Efficiency has not always meant value. Cost-sharing slows consumer use of health services. Employers offering high-deductible health plans grew almost 300% since 2009 when HRI began tracking employer health plan design. Although consumers now think more about what services to use, this trend can also inhibit early diagnosis and result in more costly chronic care management. Curtailing inpatient care lowers costs. With more hospital care shifting to less expensive ambulatory centers, retail health clinics and physicians offices, the impact has been a decrease in hospital inpatient prices.